No new comic this week! Once Upon a Time is a game we have owned for years and never played. It’s my fault we never played it, if I’m honest, so I was pretty embarrassed to discover how great it was when we did actually play it. As the name suggests, it’s a storytelling card game. In fact, having been originally printed in 1993, it might be the original storytelling card game? Anyway, it consists of a deck of cards that each lists a standard fairytale element or trope: a crown, a monster, a kingdom, a knight, a stepmother, a princess, and so on. You are dealt a hand of these cards, along with one ‘ending’ card – something along the lines of ‘and then they married and lived happily ever after’. Sprinkled in amongst these are some ‘interrupt’ cards in different categories – time, place, or person. One person begins telling a story using the cards from their hand, until they get stuck or interrupted by another player with an interrupt card, or a player that has an element that they mentioned. 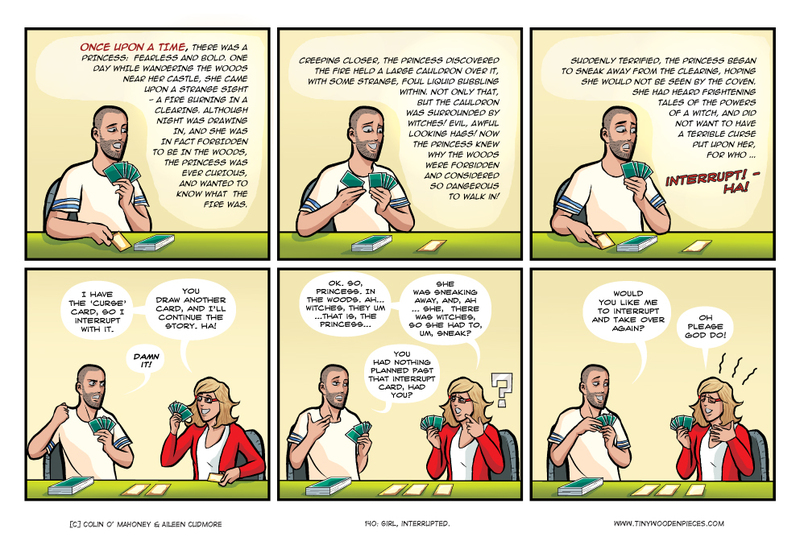 That player then continues the same story, but now they try to integrate the cards from their own hand, until they get to their ending, or are interrupted. Simple, and altogether brilliant. Once Upon a Time is one of those great games that provides a simple framework of rules that allow the players to make the game, and make it as fun as they like. The hand of cards you are dealt is small, so the game doesn’t drag on, either. The situation as described above is only one of many ways that the game provides for laughter and ridiculousness, as the story gets dragged in wildly different directions depending on who is telling it. Although it’s quick enough to be a filler game, I think its true place is as an opener. Something to warm up a group before a longer game, or even RPG. RPGs are something we are still eager to explore, but thus far, our group has only had a few games of Fiasco. Brilliant as that is, we are looking to dive deeper. We have Pathfinder and Ten Candles, so now what I am looking for are resources for running a good campaign. Story and play ideas for a Games Master. If anyone could recommend a good podcast, article, website, or anything else, I would greatly appreciate it. On a final note, we are in the process of moving house at the moment, and I’m not yet 100% sure we will be in a position to put up a new comic next week. As well as time constraints, we literally might not have a desk and internet to actually make and put it up. Fingers crossed we will figure something out in the meantime, but apologies in advance if we don’t. Oh god, how much I hated that game the one time I played it. It really is one of those games that depends upon the players to make the game, and if you’ve got someone who is playing to win it won’t work. I think they played their entire hand out in under 10 seconds. Although there are measure in the rules to prevent this, the game is definitely still open to abuse from someone who is only interested in winning, as opposed to enjoying the experience of storytelling. So you are right, it does depend on the players, which means then it is very group-dependent. Sorry to hear you had such a poor experience! Once Upon a Time definitely isn’t going to suit everyone, and that’s fair enough. I get that not everyone is going to be comfortable with a game like that. I have had more than a few recommendations for Gloom at this point, so I do really need to try it. I like the fact that it can be played as a straightforward card game, or that the players can add a lot of storytelling to it. Sounds like something I would enjoy. Good luck moving! Hope you don’t have too many hiccups getting settled in. Move is going well so far, now we’re at the stage where we just want it to be done with so we can settle into a home again, get our gaming shelf and room sorted out and get back to the fun stuff! When is the Oaxaca Kickstarter planned for? I know that feeling. We moved last year and it felt like it took forever to get settled in and the games up.